(Text automatically translated) Ideal for holidays: well equipped, surrounded by gardens, fully enclosed, quiet, located in the village center, close to shops, nearby bike path, walk through the vineyards towards the ocean. Although separate from the owner's house. Ste MARIE DE RE: typically rétais village surrounded by vineyards, beach fishing, walking, cycling for commuting throughout the Ile de Ré, near the port of ST MARTIN DE RE for the exits, and the most beautiful beaches of sand on the south coast. Walks in the pine forests. Spot for surfers to leave the village. Small local market in season. Welcome by the owners. 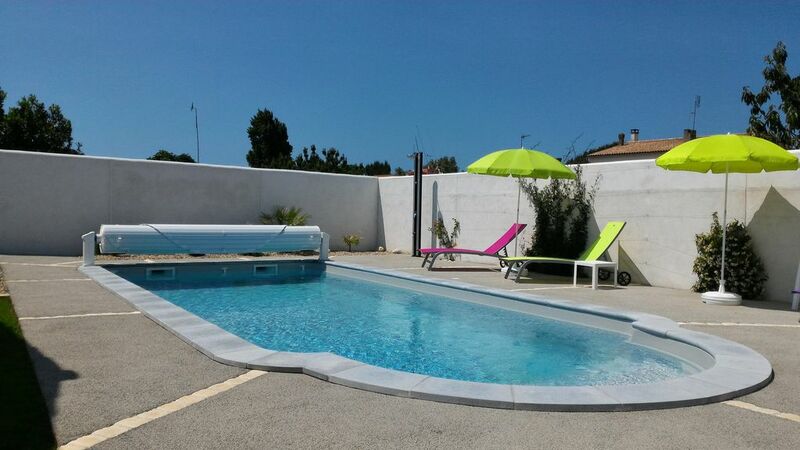 Weekly rental from September to June, and a minimum of weeks in July and August. The property was small and clean and well equiped.It was reasonably comfortable. When we first arrived at the property the owners were in the pool. It was not made clear in the advert that we would be sharing the pool with anyone. If this had been the case then we would have chosen elsewhere. The second aspect of this particular property that swayed it for us originally was the air conditioning.We discovered that the air conditioning was a very large and incredibly noisy machine in the bedroom upstairs.I don't think our boys would have been able to sleep at all if it had been at the height of the summer and we had needed it on. At the beginning of our second week the builders moved in to the owner's property that was adjoining ours.They spent two days replacing the double glazing. They started hammering and drilling by 9.30am. We felt that this should have been done after we had left bearing in mind we were the last guests of the season. The area of St Marie was very quiet and almost nothing going on. This may have been because it was at the end of the season and everything had shut for the winter. The weather was good and we only had two days of rain.We would visit the island again as we have been twice before but we would probably base ourselves in St Martin or La Flotte which was where there was some life. Indeed, the pool is to share with us, as it is specified in the description of our announcement on Homelidays HomeAway, and also on the sheet attached to the contract that I address to all our tenants. We always try to leave the priority to the holiday makers and we adapt according to their schedules. The air conditioning in the upstairs bedroom will be changed this winter against a quieter wall unit. In the face of global warming, we had already considered making this improvement. As for our work, we are sorry because the company that made the change of the windows of our house gave us this only date and we did not think that it would make noise for the house of the tenants separated by a court. Finally, the village of Sainte Marie de Ré attracts especially people who prefer their tranquility. We stayed for two weeks at this property and they were just a perfect two weeks. Mr. And Mrs. Benavente could not be more welcoming and helpful (we had a tyre explode on the drive to ile de Re), the property itself is ideal for a family of 4, was equipped with everything you could think of needing and was immaculately clean. The pool was a winner for our children, it was heated and as with everything else was beautifully clean. It is a peaceful property which was ideal for us. The location is very central in the town of St. Marie, walking distance to shops, markets and restaurants and the beach and playground. This was our first trip to Ile de Re and we would definitely return and also return to this property. Thank you very much Jean Pierre and Catherine Benavente we had an excellent holiday. Un grand merci pour tous ces compliments qui nous vont droit au coeur. Nous garderons un très bon souvenir de votre passage chez nous. Nous avons reçu un très bon accueil de nos hôtes. La maison est bien située à Sainte-Marie-de-Ré, proche des pistes cyclables (nous avions emmené nos vélos) et des petits restos et magasins. L'équipement de la maison est très complet. Nous avons pu prendre nos repas sur la grande terrasse et profiter de l'espace piscine grâce à une météo superbe. Une location impeccable et à recommander ! Nous avons aimé faire votre connaissance et vous remercions de cette merveilleuse appréciation. Nous sommes heureux que votre séjour vous a plu et vous remercions. Le logement était charmant, impeccablement propre et bien équipé. Les propriétaires sont très sympathiques et serviables. La zone de la piscine et de la cour était privée et calme et plus jolie que la photo sur le site. La propriété se sentait également en sécurité car le lecteur avait des portes électriques. Nous avons séjourné avec nos deux filles et ils ont apprécié la grande piscine (et le WiFi). Nous avons passé un très bon séjour et je recommanderais sans hésiter cette propriété. St Marie est un joli village traditionnel. Il y a un supermarché de taille raisonnable à seulement 5 minutes à pied de la propriété et deux «places» de village (une à chaque extrémité du village) avec un petit marché quotidien dans chaque boulangerie, boucherie et restaurant. Nous avons visité sans voiture et avons constaté que cela fonctionnait très bien. Nous avions tout ce dont nous avions besoin dans le village en termes de courses alimentaires, de location de vélos, etc. L'île entière dispose d'un réseau de pistes cyclables dédiées. Nous avons donc loué des vélos et exploré. Notez que le supermarché ferme à 20h00 le samedi et que les restaurants cessent de servir à 21h30. Si vous arrivez par la suite, assurez-vous de ne pas arriver affamé. Vous avez très bien décrit notre location, notre village et notre belle ile et l'on sent que vous y avez passé un très bon séjour. C'est tout ce qui importe pour nous. Tous nos remerciements. Cela a été un plaisir de partager le verre de l'amitié, suite à la victoire du foot français et belge, et de vous avoir donné toute satisfaction également. (Text automatically translated) After rounding La Rochelle by the bypass, ILE DE RE direction after the bridge at the first roundabout turn left towards "South Route". Leave the first town named Rivedoux, and you immediately get to STE MARIE. At the second roundabout, turn left "city center", the tourist office, turn right. Continue straight (main street of the town) and after Carrefour Contact, a few houses, and you can find us on the right (an access plan will be included with your booking confirmation). Common path and house adjoining the owner's. Private parking in the common way. (Text automatically translated) Bike rental: 3 in the town of St. Mary, and in every town of the island. Restaurants: The Chipping La Flotte La Pergola La Couarde, Chai pepete Ste Marie, and Ice La Martinière in St Martin (very famous). Tennis outdoor 50 m behind the lease. Marine Spa at the entrance of St. Mary. Doctors and Pharmacy 50 m. Bring your bikes: 100 km of bike paths throughout the Ile de Ré. TARIFS TTC. CAUTION 500 euros : à remettre à l'arrivée, soit chèque, soit espèces en euros, et rendue au départ, après état des lieux.